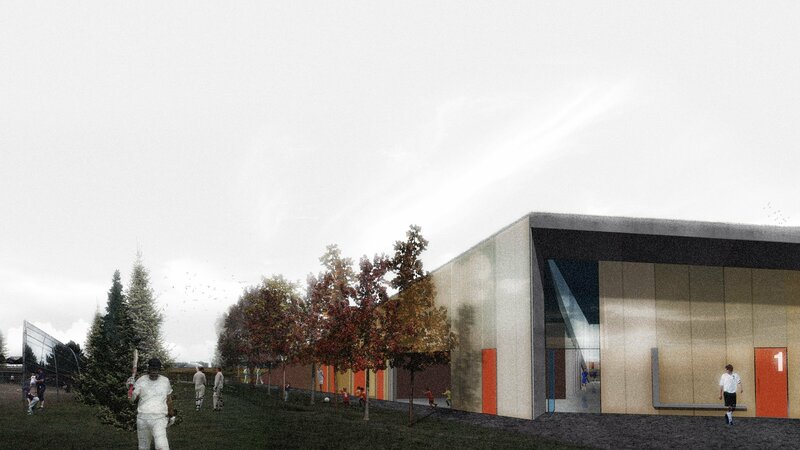 Arc and Field: A new Park Pavilion for Mill Woods Sports Park | Williamson Williamson Inc. The geometries of adjacent playing fields cue the sweeping arcs that define this new park pavilion for Mill Woods Sports Park in Edmonton, Alberta. 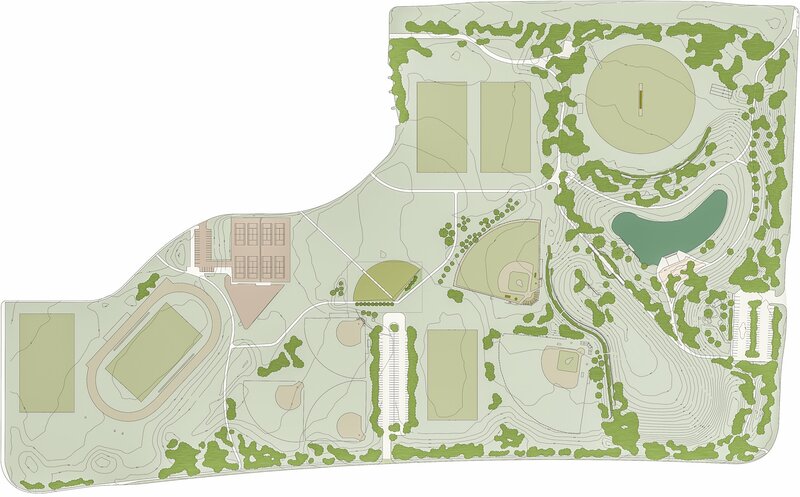 Rising from the northern edge of the site, the tilted slope of the pavilion’s green roof exposes a luminous facade to the southern sports fields and to the vehicular entry from 23rd Avenue. A fundamental component of the scheme is the Light Box which acts as a billboard for the project; its colour changing from neutral white to signal the home team’s winning colours, whether Grizzlies teal or Oilers’ orange and blue. At an urban scale, the unifying gesture of the Light Box will be a welcome resource for the community. It will identify the sports park in a way similar to that of a big box store, but speaks to the ownership of the park by the community as opposed to commercialism. The raised gesture of the building provides topography where there is none otherwise. In the flat context of the sports park, this building will serve as a hub for the multiple user groups. 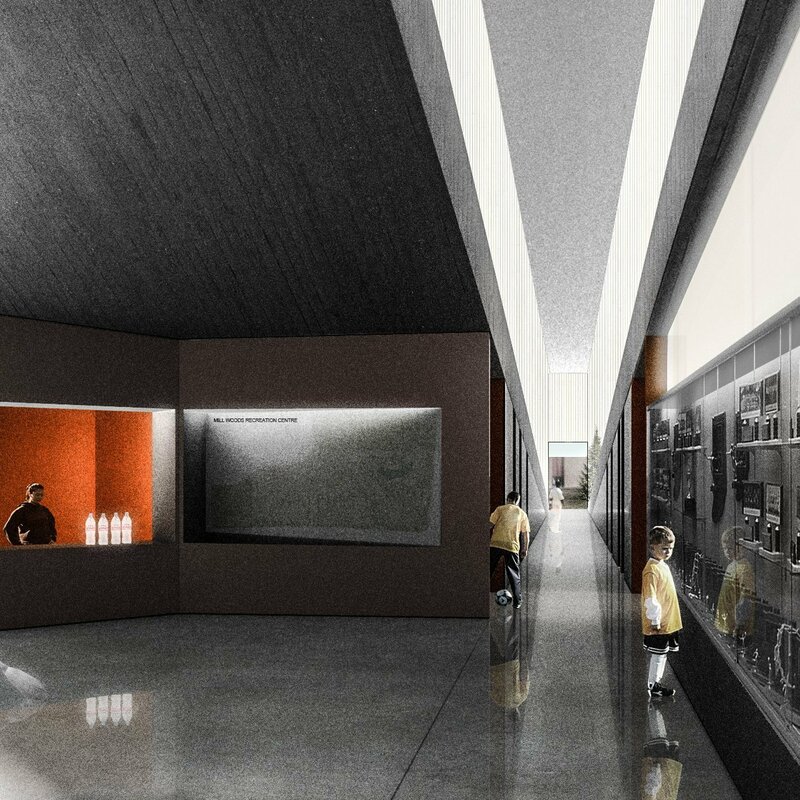 It will draw students and athletes from the north while the active faÃ§ade serves the community and teams to the south. 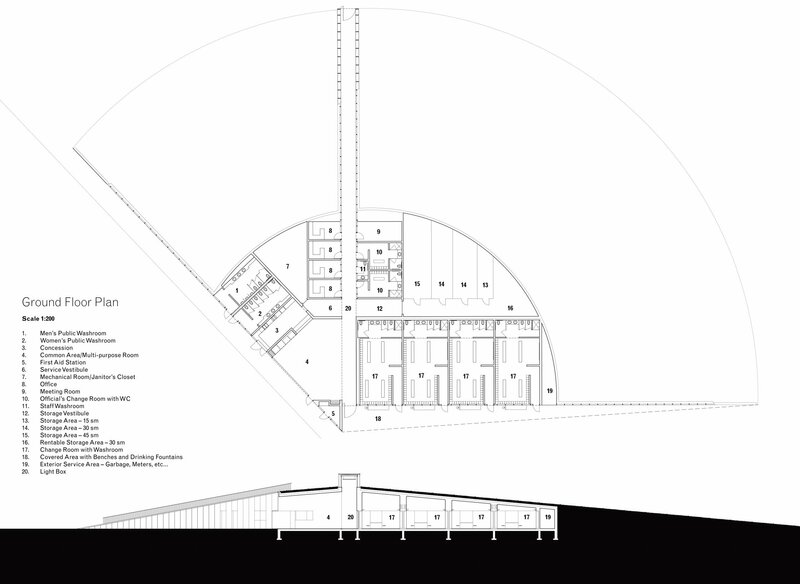 The new pavilion is divided into two programmed wedges connected by a day lit corridor. The western wedge of the pavilion houses the required city funded program with the added amenity of the Concession Area and First Aid Station. If built prior to Phase II, access to all of the programmatic spaces will be from the exterior, allowing each space to be day lit and independently accessed. The eastern wedge and Light Box constitute the second phase of construction and incorporate the Meeting Room, Change Rooms, and Storage Rooms. The Team Change Rooms open directly to the exterior while the Official’s Change Rooms are grouped off the corridor with the Offices and Meeting Room. The Storage Rooms are tucked behind this L-shaped program volume in a large room that is subdivided into flexible storage areas imagined as chain link cages that can be easily reconfigured as required. 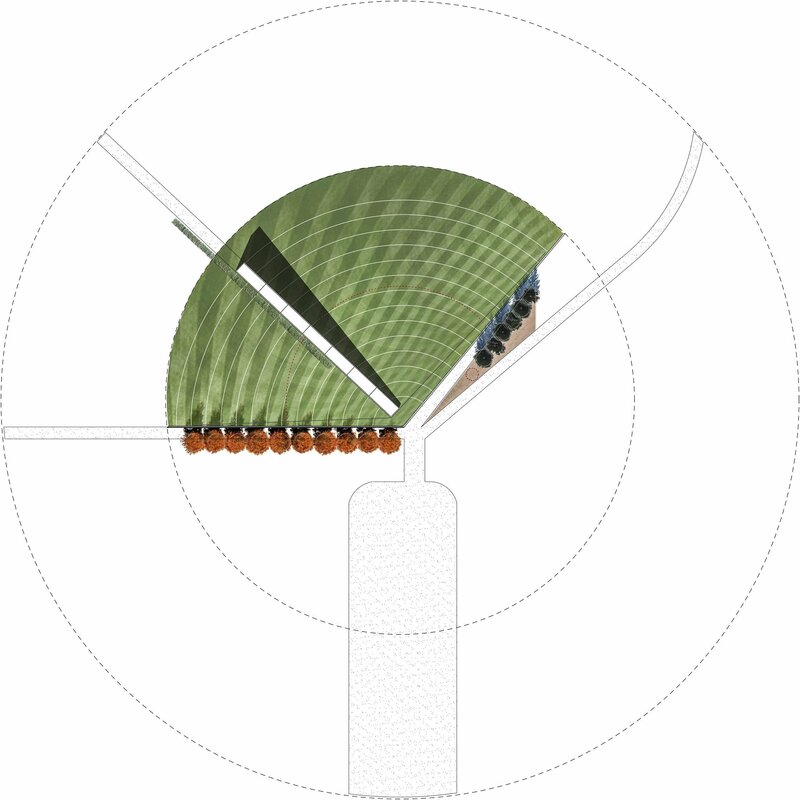 The landscape design is composed of a simple palette of species organized along the geometric lines of the site trajectories. The new multipurpose slope is covered in sod, both as a nod to the surrounding playing fields and because it is cheap, durable, and easily replaceable. It will allow summer lounging and play as well as winter sledding, seemingly the one activity that is currently missing from this well programmed sports park. In any season it provides an aerial view of the many sport fields to the south and east. A row of red maple shade trees lines the southern side of the building, blocking summer sun but allowing passive heat gain in the winter months. Tall grasses along the light box will sway with the wind and create shadow play against and within the corridor.